The Field Notes Utility notebook is the spring quarterly edition for 2017. Sold in a 3 pack of notebooks, each with 48 3 1/2" x 5 1/2" pages of either engineer graph or ledger. The engineering graph features an 1/8" grid with bolder lines each 1/2" while the ledger is great for mileage logs, lists, to do lists, etc. Each Field Notes Utility cover is "Safety Yellow" Mowhawk Via Vellum 80# with a useful flip-out ruler printed along the edge, inches on one side and centimeters on the other. The paper within the notebook is Mohawk's Via Vellum 70# "Pure White" and ruled with an grey print. Each notebook is then held together with 3 tough black staples on the spine. The corners of the notebook are rounded to a 3/8"radius. 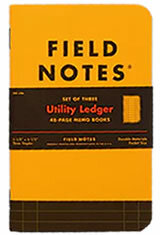 The Field Notes Utility Memo & Notebooks usually ships within 1 business day unless otherwise specified. Each Field Notes Utility Memo & Notebooks we sell is guaranteed to be genuine, authentic and will arrive brand new & unused! Field Notes are great for taking notes on the run and keeping your mind straight. I want to love these field notes. The rulings are super cool - I use ledger for personal budgeting, and engineering graph for my work notes. The paper is actually pretty fountain pen friendly, if only for fine and extra-fine nibs, but that’s what I tend to use anyway. The theme and colorway is also really great. The problem is that the binding is fraying, the corners are cut very poorly, and the paper sticks out on the back because of the fold-out ruler. This is not field notes’ usual attention to detail.